In the event of an earthquake/zombie plague/or random occupation - you’ll find emergency procedures taped to the bottom of your seat. Yes, just like a flotation device. You’ll also find a Glock 17 with a full magazine. Sushi is my once-per-week treat. Conscious, probably. But if I wasn’t, would I know? Press the keyboard at semi-random. Read the first draft and weep. Stare sullenly at the computer screen for hours. Let brain mysteriously fix story problems at 3am, and try to remember them later. Rewrite the story from scratch. Fix all the bits which weren’t wrong before but are wrong now. Repeat as necessary, for weeks/months. Eventually show the result in public and hope for the best. Start again from step 1. My most recently published work is middle-grade interactive adventure Deadline Delivery, set in a post-apocalyptic flooded city full of pirates, crocodiles, and worse. I’m now writing another interactive adventure, this one about kids who fall into a dungeon exploration computer game. 5. Do you have a favorite coffee or tea? Boxers, so my boys can swing in the breeze. Not that it improves my writing any - I don’t write that sort of thing. (Okay, I probably would if it paid well...) A typical writing day? See answer to Question 3. Hours of that, plus breaks for snacks, research, Facebook, and housework, only some of which helps with the writing. I’m writing interactive fiction, so my main character is you the reader. Which is weird to write, breaking a lot of the usual writing rules, but also fun, especially writing about “your” best friends who’ve fallen into the computer game with you. They're awful, I don't know how you put up with them. 8. Who are your favorite writers? Every good writer (I wanna write like that) and every bad writer (I coulda done better than that). Certainly not, you sick pervert. No writing deadlines, a large royalty payment appears in my bank account, and a total stranger writes a nice Amazon review of one of my books. 12. Who is your favorite fictitious villain? Or are you all about the hero? Who do you love to hate? Nah, every protagonist needs an antagonist, but out-and-out villains don’t appeal to me. No, I’m completely normal, it’s everyone else who’s weird. 14. All-time favorite movie and why? Labyrinth. So inventive, and so insanely logical. Slightly more than dental surgery. A penthouse apartment paid for with my book royalties. Cheese, coz otherwise it’s just a really really flat round loaf of bread, right? On top of the cheese, pretty much anything except olives or anchovies. A small child who hadn’t learnt to write yet. Okay, I just rolled some dice. A 1, a 5, and a 2. Random enough for you? Dunno, haven’t written them yet. Nope, I’m teetotal. As far as I’m concerned, wine is just grape juice that’s gone off. So long as it’s only a minor apocalypse and my ATM card and phone will still work, then yes, I’m fully prepared. In front of my computer. And in bed asleep - see answer to Question 3. Shrinking markets, and a zillion terrible books out there. Rising above the slush to get noticed is getting harder and harder. 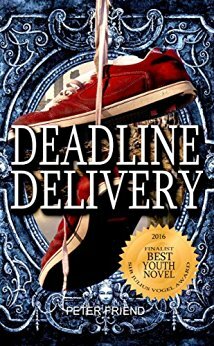 Deadline Delivery is available from Amazon, both as a standalone book https://www.amazon.com/dp/B019LFO9N8 or as part of a boxset of four You Say Which Way adventures - the paper edition is in stock at Writer's Plot Readers Read. His next book will also be published by https://yousaywhichway.com/ . I'm sure kids will love your interactive books; I'm tempted to get one for myself. Labyrinth is one of my favourite movies as well, and my kids love Adventure Time and have fun explaining the whole weird storyline to me. You are a funny guy with some original and exciting story ideas.I hope you keep persevering with your marketing because sounds to me like your books (and yourself) deserve to be noticed. Cool interview Peter. Thanks for participating, most entertaining.